All > Resources > Dunlop Geomax Terrain Chart > Dunlop GEOMAX MX33 - Soft to Intermediate - NEW! 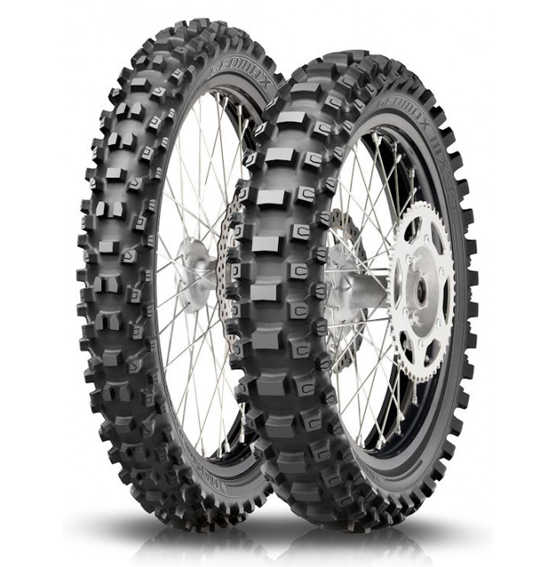 Dunlop GEOMAX MX33 - Soft to Intermediate - NEW! Developed with the help of top motocross pros, the all-new GEOMAX MX33 is the new industry standard for soft-to-intermediate terrain. Dunlop’s innovative new technologies offer superior grip, slide control, bump absorption and enhanced durability. Front tyre features Block-In-A-Block technology to aid in linear tracking and improved steering. Front and rear tyres include new tie bars that connect each knob, improving durability by reducing flex at the base of the knobs. Carcass Tension Control System allows even flex throughout the tyre for increased bump absorption. An all-new compound in the front and rear enhances durability without sacrificing the legendary grip of the Geomax line. Stock information for Dunlop GEOMAX MX33 - Soft to Intermediate - NEW!